SKT T1 has long been the most dominant force in League of Legends, winning three Worlds championships. Given the results of today’s Mid-Season Invitational finals, it doesn’t look like that’s changing anytime soon, as SKT T1 beat G2 for the MSI title, 3-1. The South Korean team as the top seed from their region, after a 3-0 victory over KT Rolster. Boasting some of the best players in the world in every role, SKT T1 looked dominant coming into the grand finals, but European squad G2 Esports were hoping to topple the titan and prove that this year’s Worlds wouldn’t be a sure thing for SKT. Right out of the gate, G2's mid lane player Luka “PerkZ” Perkovic established himself in against the intimidating Lee “Faker” Sang-hyeok. 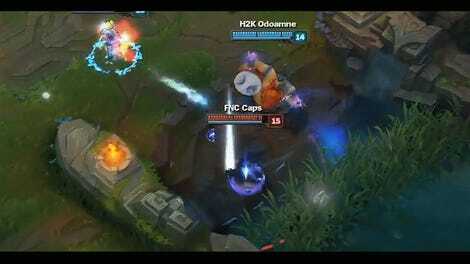 Throughout the early game, G2 kept pressure on Faker, repeatedly attacking his lane and killing him to prevent him from getting too much gold and experience. Despite the early lead on SKT’s star mid laner, the rest of the team rallied—if anything, these finals were a reminder that SKT is an all-star team in all roles. Jungle player Han “Peanut” Wang-ho was 4-0 on Lee Sin at the Invitational going into the finals, and every game he managed to secure the blind monk in the draft, it was trouble for G2. Coming back to win game one, G2 came out strong again in game two by keeping Peanut off Lee Sin, forcing him onto an Ivern. 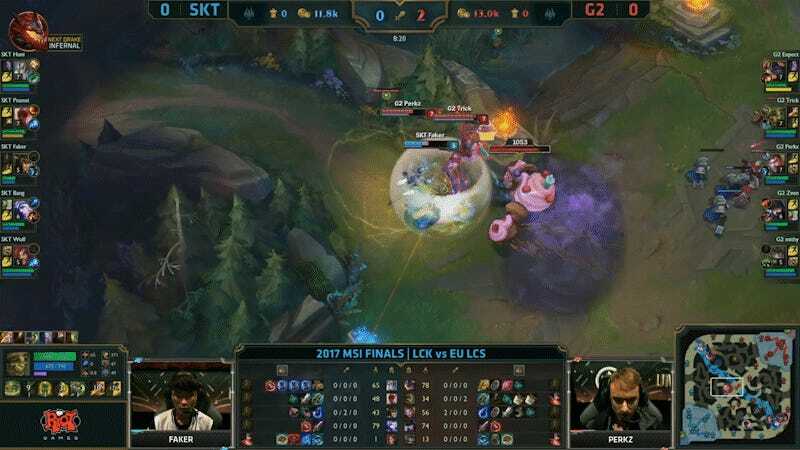 Here, it was marksman player Jesper “Zven” Svenningsen’s turn to shine, as he rained artillery shots down as Kog’Maw on the SKT lineup, pulling out a game two and drawing blood against the SKT giants. G2 clearly didn’t learn from game two, however, and Peanut got his Lee Sin back in game three, which turned into a scrap between the two teams that swung back and forth. Eventually, SKT’s gold lead became insurmountable for G2, and the European team found itself down 2-1 in game four, staring down elimination at MSI. Despite stealing away Lee Sin, SKT looked like a well-oiled machine in game four, with every player contributing in full. In particular, Lee “Wolf” Jae-wan particularly showed up on his support Tahm Kench, kiting and saving teammates by swallowing them up, then launching into the back line with Faker in tow to tear apart G2's lineup. SKT T1 emerged the two-time victor at the 2017 Mid-Season Invitational, but for G2, drawing blood on the champ in the grand finals was an achievement in and of itself. It at least gives me hope that a few months from now, at the 2017 Worlds Championship, the level of competition will have risen to meet SKT like G2 did in this series.